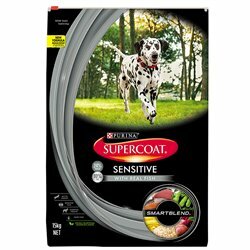 SUPERCOAT There are 9 products. Specifically formulated for large & giant breed puppies up to 24 months. 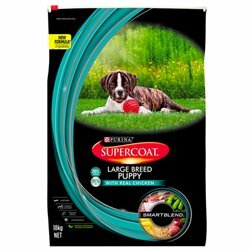 SUPERCOAT® SMARTBLEND® Puppy Large Breed With Real Meat provides complete and balanced nutrition, with no artificial colours or flavours, to help give your puppy a healthy start to life. Specifically formulated for adult dogs 1 to 7 years. SUPERCOAT® SMARTBLEND® Adult With Real Chicken provides complete and balanced nutrition, with no artificial colours or flavours, to help keep your dog happy and healthy. Specifically formulated for adult dogs 1 to 7 years. SUPERCOAT® SMARTBLEND® Adult With Real Beef provides complete and balanced nutrition, with no artificial colours or flavours, to help keep your dog happy and healthy. Specifically formulated for less active or overweight dogs. 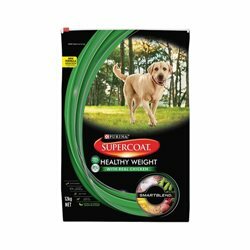 SUPERCOAT Healthy Weight With Real Meat provides complete and balanced nutrition, with no artificial colours or flavours, to help keep your dog happy and healthy. Specifically formulated for older dogs from 7 years. SUPERCOAT Senior With Real Tuna provides complete and balanced nutrition, with no artificial colours or flavours, to help keep your senior dog happy and healthy. Specifically formulated for dogs with sensitive skin & stomachs. SUPERCOAT® SMARTBLEND® Sensitive With Real Fish provides complete and balanced nutrition, with no artificial colours or flavours, to help keep your dog happy and healthy.